Nomad released its all-new Vulcanized LSR Silicone Strap for Apple Watch with an already-affordable $40 price tag just last week. Now you can drop it down to just $31.96 shipped (20% off) when you enter coupon code WC20 at checkout. Please note: It’s currently slated to ship October 31, but don’t let that deter you. Placing your order now reserves your spot in line and guarantees you a discount since the coupon expires this weekend. Nomad utilized silicone for the band making it extra durable, water resistant and safe for your skin. Available with Black or Silver stainless steel hardware for the 42mm Apple Watch. 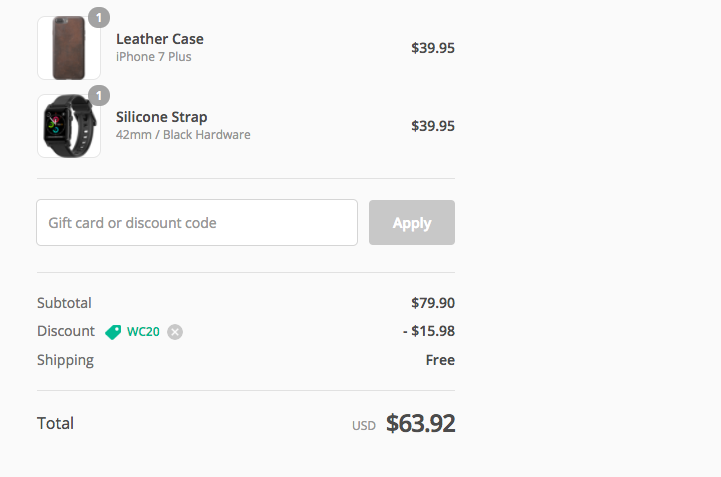 If some of Nomad’s other gear like its latest iPhone 7/Plus leather case or Carabiner Lightning cable happen to catch your eye, just apply the same coupon code (WC20) and you’ll save 20%. In fact, nearly everything Nomad sells is eligible for today’s discount. Nomad accepts payment via PayPal, Amazon and, of course, credit card. Shipping is free on all US orders. We set out to make the best sport strap for Apple Watch. To do so, we selected silicone for its dynamic polymeric properties. Silicone is not only water resistant, but repels water at an elemental level. Its inherent ultraviolet resistance means that your strap will maintain its sheen through extended exposure to nature’s elements. And unlike petroleum-based rubbers which are laden with chemicals, silicone’s natural low toxicity and naturally hypoallergenic traits makes it an ideal material for a product that is in consistent contact with your skin.